The HS-4210 digital, static cone penetrometer (DSCP), with its large, digital readout, makes testing and recording readings easy. 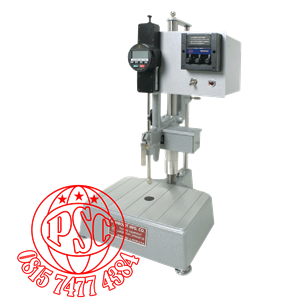 The DSCP can be used to evaluate soil consistency by determining the soil’s level of compaction and/or the bearing capacity. The DSCP is especially useful in evaluating shallow foundations and pavement subgrades where fine-grained and soft soils are being used. The DSCP can also be used to aid technicians in quickly selecting sites for testing, as well as correlating with other tests, based on local conditions, such as standard or modified Proctor, CBR or bearing capacity. The DSCP uses a dual-rod design, which eliminates the need to correct for soil friction on the rod as the cone is pushed through the material. Penetration resistance is read directly from the cone tip and registered on the digital display. The unit comes with a 30" starter rod and a 60° cone with a 1.5cm² area. Note : The use of static cone penetrometers should not replace laboratory testing of field analysis or be used to produce foundation design data. A) This procedure is used to assess the in place strength of undisturbed soil and/or compacted materials. The bearing capacity can be used to estimate CBR (California Bearing Ratio), shear strength of strata, thickness of strata and bearing capacity. It may be used in horizontal or vertical construction applications, such as footings and shallow foundations. Typically it is used to assess material properties to a depth of 762 mm (30 inches) below the surface. With extensions the DSCP can be advanced to greater depths. B) The operator pushes the DSCP into soil by applying weight to the handles. This is designed to handle applied loads up to 250 lb. Loads higher than this will result in an “overload” reading on display. The penetration rate should be consistent and no eratic loads should be applied vertically or horizontally as this will result in unreliable information and could result in bending of the rod. Through continued use of this tool, correlation charts may be developed on local material to correlate to blow counts, unconfined, in situ CBR and other measurements. C) The Humboldt DSCP can be used to estimate the strength characteristics of fine and grained soils used for construction materials and weak stabilized or modified materials. 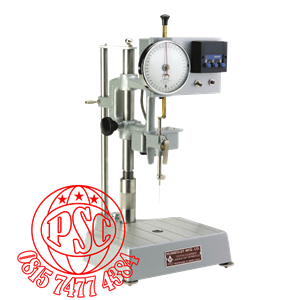 This may be used to classify cohesive soils in terms of consistency, determining the approximate unconfined compressive strength and the evaluation of shear strength using the penetration principle. These readings do not replace laboratory tests but may be used to obtain needed field data. The Humboldt DSCP should not be used in highly stabilized or cemented materials or for granular materials. D) The Humboldt DSCP can be used to estimate the strength of in situ materials underlying a bound or highly stabilized layer by first drilling or coring an access hole. A) The Humboldt DSCP in Figure 1 consists of a large easy to read display, Multiple selectable display units, padded handle grips, 30" dual rod design starter rod with available extensions and a standard 1.5 cm² with an angle of 60°cone. Standard hardened stainless steel needle, 40-45 mm exposed needle length. Wt. 2.5 g.
Same as H-1280. Certified to ASTM accuracy by independent laboratory. Wt. 2.5 g.
Same as H-1290. Certified to ASTM accuracy by independent laboratory. Wt. 2.5 g.
Long hardened stainless steel needle, 50-55mm exposed needle length. Wt. 2.5 g.
Hardened stainless steel wax blunt tip of truncated cone. Ferrule is approx. 3.2 mm dia. Wt. 2.5 g.
Same as H-1310. Certified to ASTM accuracy by independent laboratory. Hardened stainless steel tip with special plunger. Total wt. 60 g ± .050 g.
Resilience ball penetration tool. Total wt. 27.5 g.
Hollow 90° brass cone, highly polished stainless steel tip. Removable nut and stem. Wt. 102.5 g.
Same as H-2520, completely made of stainless steel. Wt. 102.5 g.
Stainless steel replacement tip, nut and stem. Magnesium cone and plunger, same dim. as H-2520. Total wt. cone and plunger 30.0 g.
Aluminum. Same dimension as H-2520. Total wt. 35 g.
10° aluminum cone, 3.2 mm ferrule,0.8 mm stainless steel blunt tip. Overall length 106 mm. Wt. 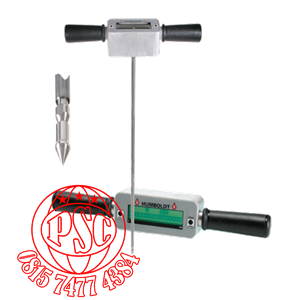 45 g.
The Humboldt Electric Automatic Penetrometer is of rugged construction, but requires careful handling to safeguard its accuracy. Keep the instrument clean at all times – especially the drop and indicator plungers, which constitute the spindle assembly. Use denatured alcohol as the cleaner for these surfaces. For complete test procedure (s), refer to the following specifications: ASTM D5, D217, D937, D1168, D1321, D1403, D1831, and AASHTO T49. Level the instrument carefully by means of the leveling screws on the base, sighting the spirit level from above, in order to obtain accurate alignment. After the instrument has been leveled, avoid shifting its location. Position the height of the supporting casting by turning the knurled travel nut on the main support post and then tighten the black knob. If additional weights are used, these should be taken from the side post and set on the end of the plunger ( opposite end of the needle chuck ). Insert penetrating needle or cone into chuck and tighten the chuck screw. As supplied by Humboldt the unit is programmed to provide a solenoid actuation period ( plunger release ) of 5 seconds. The panel-mounted, electronic timer uses 120 VAC, 50/60 Hz. In order to use 240 VAC, a step-down transformer or converter suitable for digital circuits is required. The H-1240.4F is supplied with an H-1042 transformer for this purpose and is plug compatible with the penetrometer cap-plug, but requires the input line cord to the transformer to be wired for local service. For further timer information refer to the ATC Model 365B Long Range Timer Instructions. Holding the plunger with one hand, squeeze the lever on the front of the support casting with the other to allow raising the plunger & needle to clear the sample. Flip the toggle switch on the front panel to the up position and pre-select the specified time of penetration by turning the knobs on the timer bezel. To conduct a test set the needle, cone or micro-cone on the sample surface. When ready to begin, press the red pushbutton on the front panel to release the plunger for the pre-selected amount time. The timer- controlled electromagnet will immediately release the plunger and after the preselected time interval will re-grip it to stop the test. Measure the travel of the plunger assembly by lowering the dial indicator rod to contact the plunger and observing the dial reading. To reset for the next test, the front panel toggle switch must first be flipped to the down position, then the above sequence can be repeated. CAUTION : Keep hands, clothing and other objects away from moving parts when the machine is in operation.